ALC Deer Leather is made from the skins of farmed animals, reared for commercial venison sales. The meat, from the DEFRA licensed abattoir goes off to the restaurant kitchens of renowned chefs, hotels and premium supermarket ranges and the skins are salted to preserve them for tanning. The tanning process is fundamentally a chemical means of turning the collagen protein in the skins, which is unstable and putescible, into a material that is stable and will not rot. The nature of the specific application of the process governs the properties of the resulting leather. 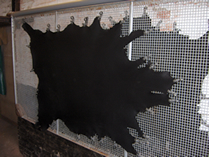 Tanning hides and skins to make leather has been around since pre-historic times and the commercial methods applied today are scientifically well understood and controlled. The salted skins are taken to a commercial tannery, where the fundamental preservation (tanning process) will take place. Over several days, using large quantities of water (to remove and wash away unwanted protein constituents –hair & fats, that prevent the tanning solution getting full effect on the collagen protein of the skins) and carefully measured amounts of chemicals, the skins are converted into the first “rough-tanned” stage. Making light-weight leathers that will be soft and flexible uses a quantity of Chromium Sulphate as the main tanning agent. (Approximately 85% of the leather made in the world is Chrome-tanned). The Chrome imparts a blue colouration to the skins and the material is referred to as “wet-blue” at this stage. The skins are put through a samming machine, which is effectively an industrial mangle, to remove excess water and reduce the weight for transport, then the skins are taken to the next stage in the dressing plant. This is the point at which the actual customer specifications for thickness, colour and feel can be achieved. The skins are shaved on the flesh side to achieve an accurate tolerance, giving the desired thickness, then they go into the dyeing process, again over several days. In the dyeing vessel, a 5-stage chemical process prepares the skins for dyeing, firstly allows the dyes to be mixed, to match a specific colour requirement and penetrate evenly through the thickness of the skin. Next a particular blend of extra tanning agents (special proprietary chemicals) is used to modify the ultimate feel of the leather, once dried. Specific types are selected for a firmer-dress shoe or bag leather, and different ones for clothing or glove leather, depending on the needs of the customer. The dye shade is adjusted using additional dye or perhaps a mild bleaching agent, to make sure that the customer’s desired colour is reached within a fine tolerance. Next a special blend of oils is added to the vessel, these will provide the necessary degree of flexibility in the leather, without feeling greasy, because their molecules chemically bond to the leather fibres at the microscopic level. These materials can be selected to provide water resistance in the finished product that is engineered-in to the leather. Lastly, careful adjustment of the final pH of the system, switches-on the “fixation” reaction, by which all of the materials become stable and chemically bound to the leather fibres. Careful control of the drying process is critical to the appearance and feel of the leather. If you have ever dried a chamois leather on a radiator or put a pair of wet leather gloves on the hot water tank in the airing cupboard, you know that the result is hard, even crispy! As a natural fibrous material, leather is best dried slowly, under accurately controlled conditions to become soft & pliable, with the desired amount of stretch. Trying to accelerate this process will produce a hard or firm product that will not give as long a life in service. 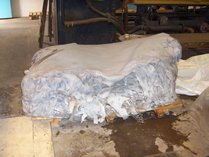 If the skins are to be produced as suede, the nap is prepared at this stage. 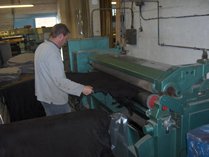 Mechanical softening follows, today, the leather is put through a series of machines to gently flex and separate the fibres, imparting a soft, supple feel (to the customer’s specifications). A forced-dried leather does not respond well to this action and instead of flexing, the fibres tend to fracture, giving an internal weakness at the microscopic level. Once dried and softened, the leather can be sold as “full aniline” with no surface finish coating. Depending on the specific selection of dyes and other materials which are “extra-fast”, the leather could be produced as either hand or machine washable (at extra cost). 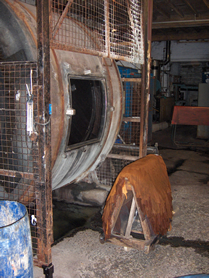 A third sub-contract plant undertakes the finishing of ALC Deer Leather. The use of specially formulated polymers and pigments provides extra protection for the surface of the leather. The colour can be adjusted at this stage and the final appearance of the degree of gloss or mattness can be regulated. Additional to this, the leather can be embossed under heat & pressure with a wide range of designs, depending on the customer requirement, some very natural looking and some that might be considered inappropriate for deer leather. The deer leather is now complete. It is sold to the customer by unit area, so needs to be measured and packed, ready for transport. Before this, the skins are inspected, graded and trimmed as necessary, to improve the presentation and ensure that any process damage that might have been caused in the factory does not go to the customer at “full price”.